The difference between software and solutions. A few hours later, a group of teachers visited our booth and were nice enough to take some time to hear about our product. I asked where they taught and they said that they worked in the same district as the school administrator from earlier in the day. As the conversation continued, I expected them to say, “Otus looks really great, but we already use [LMS name withheld],” just like their administrator said. But, they didn’t. One teacher said, “THIS is what we need! Our district is paying for [an LMS] which nobody uses — Otus is something that we would actually use because it has everything we need in one spot!”. In summary, the administrator said that the district had a software while the teachers in that district said they didn’t have a solution. There was a disconnect. Is your district paying for a service or using a service (or both)?Don’t renew subscriptions simply because you paid for it last year. Start by finding out what is being used and what isn’t (let’s let the efficacy thing alone for now). From what I saw on the exhibit floor, a new niche is emerging in K-12 edtech — tools that allow school systems to track app usage in real-time. Has anything changed within the past year?The answer is yes. Your needs have changed since last year, as have the needs of your teachers, students, and families. Software platforms have changed since last year, too. What may have been lame last year might be amazing this year (and vice-versa). What was a paid tool may now be a free tool. Revisit past decisions and continuously learn from the mistakes and successes! 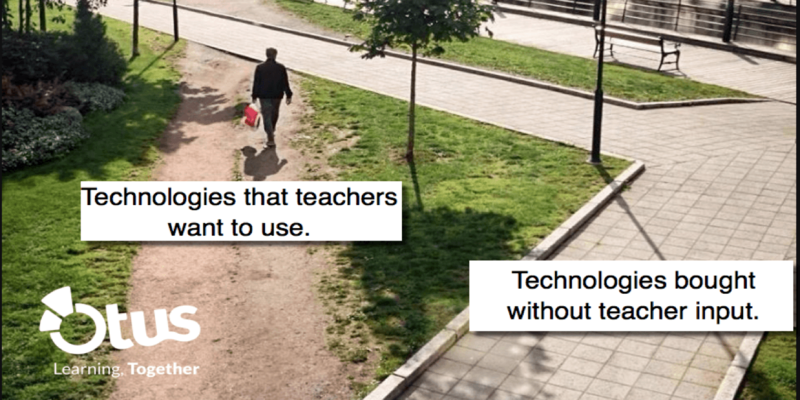 What do classroom teachers really need in order to support district initiatives?It’s critical that technology leaders and classroom teachers are on the same page with regard to what technology tools are right for the job. Just because you find a tool “cool” doesn’t mean that it will actually help classroom teachers with their goals for their students. If teachers are disagreeing with you, it’s understandable if you are defensive for a day or two — but, then seriously think about their feedback and circle back with them. Technology leaders, educators, edtech companies, and consultants all have the best intentions and want to do what’s right for kids. In order to ensure that everyone is not only on the same boat but rowing in the same direction, keep in mind that communication is key! That communication will ensure that you are not just paying for edtech tools, but are actually using them to help provide the right solutions. Note: *The meme above is widely used to represent the difference between UI and design. And, people love to debate its relevance.